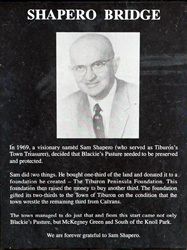 In 1969, a visionary named Sam Shapero (who served as Tiburon’s Town Treasurer), decided that Blackie’s Pasture needed to be preserved and protected. Sam did two things. He bought one third of the land and donated it to a foundation he created–The Tiburon Peninsula Foundation. This foundation then raised the money to buy another third. The foundation gifted its two thirds to the Town of Tiburon on the condition that the Town wrestle the remaining third from Caltrans. The Town managed to do just that and from this start came not only Blackie’s Pasture, but McKegney Green and the South of the Knoll Park. We are forever grateful to Sam Shapero. The Tiburon Peninsula Foundation contributes to the sense of community on the Tiburon Peninsula. Our mission is to develop projects, often in partnership with other organizations to strengthen the character of our community.